My guest has made his mark in organizational process improvement, and he contends that respect for people and relationship building are key in achieving extraordinary transformation. Mack Story is the Co-Founder of Top Story Leadership. With 11,000-plus hours of experience leading hundreds of leaders and thousands of their cross-functional teams, Mack is an authority in organizational process improvement. 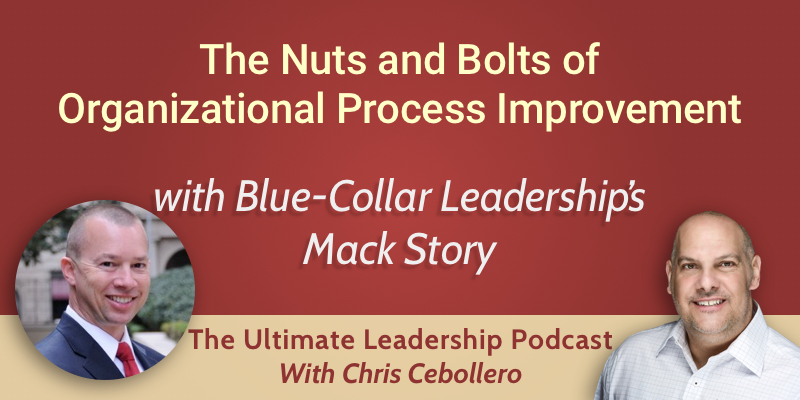 He began his career in manufacturing on the front lines of a machine shop, and he authored the Blue-Collar Leadership Series to provide that niche audience with the tools to grow their influence. Today we discuss the importance of buy-in when it comes to process improvement and the differences between Lean principles and practices. When Mack saw John present on video, laughing with the crowd and poking fun at low-impact leaders, he thought, “I could do that.” Mack credits Maxwell with inspiring him to become a consultant in the space, and lists his book, The 5 Levels of Leadership along with The 7 Habits of Highly Effective People as the foundation of his understanding of effective leadership. Every company is trying to get better, and Lean is simply a set of tools that “allows people to formally train and develop their people to improve processes in a methodical way.” Mack has spent the vast majority of his 11,000-hour career as a consultant leading 6- to 12-person teams, usually on the shop floor in a manufacturing facility. He goes in on a Monday, and by Friday they’ve accomplished an unbelievable transformation of either the space on the shop floor itself or some process – with a group of people who were not a team on Monday. Mack argues that most companies focus on continuous improvement and bypass respect for people, but he believes that the respect component should come first. And respect involves more than simply being nice to your employees and giving them a turkey at Thanksgiving. True respect means that you are committed to leadership development for every staff member at every level. John Maxwell teaches the precept of “leadership as influence,” and Mack stands behind the idea that every member of an organization should be seen as a leader. Remember, leadership is a verb – the action you take to serve the people who work for you. Part of that action must involve supporting your team members in the growth and development their influence. Mack defines a leadership expert as “someone who knows how much they don’t know,” and has the passion to become a lifelong student of leadership. True leaders have the foresight to say, “I may need to adjust this process,” and they solicit input from their workforce before initiating process improvement. When Mack goes into an organization on a Monday, he often encounters resistance: “They don’t like you. They don’t like each other. They don’t like the boss. They don’t like change.” Job number one is building a relationship. In fact, he employs the Mack Story 20/80 Rule, spending 20% of his time on personal growth and leadership development. This process of “priming the pump” prepares the team members to work together – and to work with Mack. The relationship-building aspect of process improvement is an art form, and many leadership consultants are ineffective because they are lacking in this area. The team must buy into the leader before they will buy into the leader’s vision. Jim Womack, the guru of Lean in the US, explains that “Lean Leaders go slow to go fast,” whereas traditional leaders “go fast to go slow.” Take the time to build a relationship now, and you will see the results. With only five days, Mack knows he needs to secure buy-in quickly, so he explains that what he has to teach will help the employees get a job somewhere else, if that is what they want. Not only that, it applies to relationships with family and friends as well. Process improvement methodology is relevant to all aspects of our lives and can be applied anywhere you go. According to Gallup, up to 73% of our workforce is either disengaged or actively disengaged. Process improvement offers employees the tools to finally make the difference, to be the change agent on the front lines that can help the company change and grow. In most cases, these employees see their value and end up wanting to stay and be a part of the Lean Team that helps make the organization better. Mack loves working with companies brand new to Lean. He loves changing the way people think, especially when they are skeptical: “What you see at Toyota won’t work here.” He teaches that there is a difference between principles and practices. There are thousands of ways to apply them, but the principles of process improvement apply everywhere – at the dentist’s office, when you mow your lawn, etc. The same goes for leadership. As John Maxwell says, “Never tell a story without making a point, and never make a point without telling a story.” The story is the practice; the point is the principle. They work together, but the principles provide the foundation. You can learn more about Mack through his YouTube Channel and his website, BlueCollarLeadership.com. He can be reached at 334-728-4143.